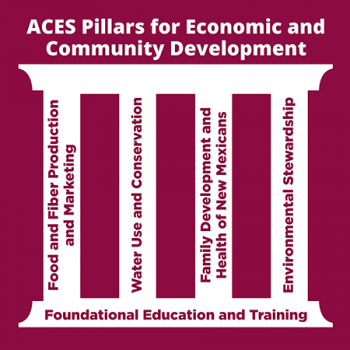 The College of ACES positively affects the health, economy, and environment of New Mexicans. See the following stores that illustrate the College's Impact. This Pillar addresses the production, protection, and marketing of plant and animal products. College of ACES faculty and staff foster technological innovation to enhance competitiveness and security of New Mexico agriculture, and increase value-added in the state. Water is the most limiting resource for New Mexico. All aspects of water use affect agricultural efficiency, profitability, and human health. Water management will become more critical as water demands for urbanization and industrialization increase. The family is the fundamental institution of society. The College of ACES conducts research on human behavior, child and adolescent development, human nutrition and food science, clothing and textiles, and family resource management. The College’s research and Extension programs on human nutrition and wellness are aimed at keeping people from getting sick, and might be considered “preventive medicine” programs. The College of ACES conducts traditional education functions, like other NMSU colleges. The academic programs are enriched by participation from researchers and Extension faculty, so learning opportunities are not limited to the classroom, thus preparing students for their chosen professions.